DURHAM, N.H. - The University of New Hampshire women's ice hockey team was defeated by Merrimack College, 2-1, on Saturday, February 9 at the Whittemore Center Arena. Junior Tori Howran (Bancroft, Ontario) scored a late third period goal, but it was not enough for the Wildcats to come back. The Wildcats were outshot 12-7 in the first period but rebounded back, outshooting the Warriors 13-6 in the econd and 16-9 in the third. Despite that effort on the shot chart, Merrimack tallied goals midway through the second and third periods to secure the victory and key conference points. Howran's goal was her fourth of the season; assists came from Paige Rynne (Ancaster, Ontario) and Taylor Wenczkowksi (Rochester, N.H.), for Rynne's seventh of the season and Wenczkowski's sixth. In net, senior captain Kyra Smith (Littleton, Colo.) made 25 saves on 27 shots faced in the contest to put her record to 12-9-2 on the year. - After a full 20 minutes of play, UNH and Merrimack entered the locker rooms scoreless. 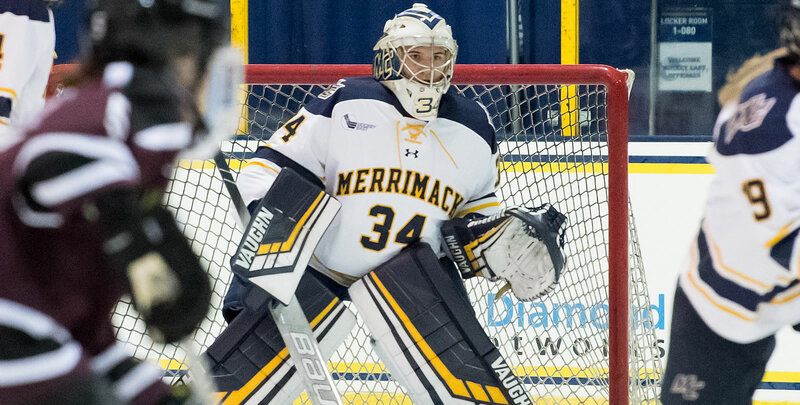 Kyra Smith made 12 saves, and Merrimack's Samantha Ridgewell saved seven shots. - Merrimack notched the first goal of the game midway through the second period. With traffic in front of the net, Keisha DiCaire could not get a shot off and sent the puck cross-ice to Chloe Cook. Cook sailed the puck from the far right corner just past Smith's glove-side to make it 1-0 at 13:23. - Upping their lead, Merrimack's Mikyla Grant- Mentis centered a pass across to Dominique Kremer, who took a shot that was blocked. Keisha DiCaire corralled the puck off the block, slipping it past Smith making it 2-0 at 11:31 of the third. - The Wildcats cut the deficit, 2-1, late in the third with the goaltender pulled. Taylor Wenczkowski tipped a pass to Tori Howran just north of the right faceoff circle. Firing the puck, Howran was able to find the back of the net at 18:16. - The Wildcats' home record falls to 7-5-2 on the season. - UNH went 0-6 on the power play; they are now 3-10-3 this season when not scoring a power play goal. - On the other side, Merrimack went 0-4 on the power play, which puts the Wildcats' penalty kill percentage on the season to 87.3% on the year. They have allowed just 13 power play goals this season. - With an assist, Taylor Wenczkowski remains atop the UNH scoring leaders with a team-high 22 points on the year. - The win prevents a UNH season-series sweep with Merrimack. UNH won the season series 2-1-0. It was just Merrimack's third win all-time against UNH. - With the results, Merrimack remains in fifth in the Hockey East standings with two weekends remaining in the regular season. UNH remains in sixth, with UConn getting a point on the day to tie UNH with 21 conference points. UConn holds the season tiebreaker over UNH.